Jennifer believes the point of learning to live frugally is to stress less and enjoy life. Never let frugal mindset get in the way of your love for life. Why is it so difficult to stay on budget during a trip to the supermarket? Why do you always seem to spend more than you planned? The most profitable items are almost always found on the middle shelves at eye-level or at the aisle endcaps. The manufacturers’ pay a premium for these spots, so they build the added cost into the margin for the product. That means that, at the end of the day, you pay more. High-end products focused on selling to children will also be placed at eye-level for their customers…which is just a couple shelves lower than those targeting adult consumers. Aisle endcaps are also premium spots for products trying to tempt you into an impulse buy. Placing essentials, usually milk, at the back of the store represents a classic trick that similar businesses have been using for a long time. This tactic forces you to walk through the store to get the things you need. That means on the way in and the way out you’ll have to go past everything else. To amplify this tactic they will also place other essentials like bread or meats at the opposite end of the supermarket to get you to cover as much ground as possible. You probably don’t put a candy bar or a Hollywood rumors magazine on your shopping list, so how do you end up with both when you walk out? Supermarkets know that the checkout line is the perfect place for impulse products. You’re basically forced to stand there and notice them. At that point, all it takes is a split-second and they’re in your cart. In some cases, it makes sense to partner different items together. For example, placing the salsa and dips next to the chips or putting hot chocolate next to marshmallows. Doing this helps to encourage unplanned purchases. You’re much more likely to talk yourself into buying something when you can visually pair it with what you are going to use it with. Have you ever wondered why the rotisserie chicken, fruit, baked goods and other high-margin items always seem to be in the front of the store? Research has shown that shoppers are most easily tempted and most likely to spend extra money when they first enter the supermarket. The supermarkets take advantage of this buy putting the highest margin items in front of you immediately. Did you know that shoppers that travel in a counter-clockwise direction spend more than those who travel in a clockwise direction? Weird right? Apparently, it has something to do with the fact that most of us are right handed so we are more predisposed to pick up items when that hand is closer to the shelves. The research backs it up. 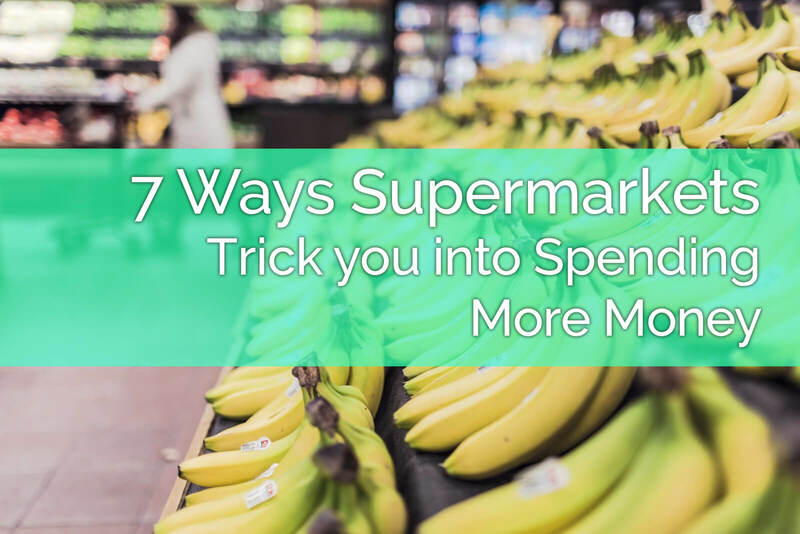 You will notice that the majority of supermarkets put their entrances to the right-hand side of the store and you enter through the open fresh fruit section. This encourages you to walk through to the back corner and then turn left setting off a counter-clockwise route. You’ve probably noticed that most supermarkets play music over the speakers while you shop. It turns out that there is a very good reason for this. Research has shown that slow, pleasing music makes shoppers feel more comfortable. Shoppers tend to slow down and buy more items when this type of music is playing. So, don’t let those cheery old tunes cost you money!